An agreement was signed on 17 September between the ADB Country Director and the Secretary of Mahaweli Development, releasing the $150 million first tranche of the three-tranche aid program, commonly referred to as the Moragahakanda Water Supply Project. The primary agreement was signed in June 2015, where ADB agreed to provide $453 million of the $675 million project cost. The program proposes to transfer the Amban Ganga waters to North Western, North Central and Northern Provinces under four investment projects to be completed by 2024. The Mahaweli development proposal of 1970s envisaged the construction of several multipurpose projects associated with Mahaweli Ganga and Amban Ganga. The Mahaweli waters were diverted at Polgolla in 1976, generating power at Ukuwela and diverted again at Bowatenna supplying water to the Kalawewa and Anuradhapura group of tanks. Next was the Moragahakanda reservoir on Amban Ganga, a tributary of Mahaweli and the transfer of water through a canal system to the lowest rainfall region in the country, north of Vavuniya, generally referred to as the Moragahakanda project. The J.R. Jayewardene Government, elected to power in 1977, modified the original program, dropped Moragahakanda, and under an accelerated program completed dams and power plants at Victoria, Randenigala and Rantembe and the Right Bank Channel which delivers water to Maduru Oya and System C, all in six years. These irrigation facilities are responsible for the country achieving near self-sufficiency in rice. Communal problems in 1983 suspended Moragahakanda, although the Japanese were prepared to fund the project when other countries boycotted Sri Lanka. The general understanding among the ruling parties were that, in a final settlement of the ethnic issue, the Moragahakanda waters would be offered to the north as a gift from the south. 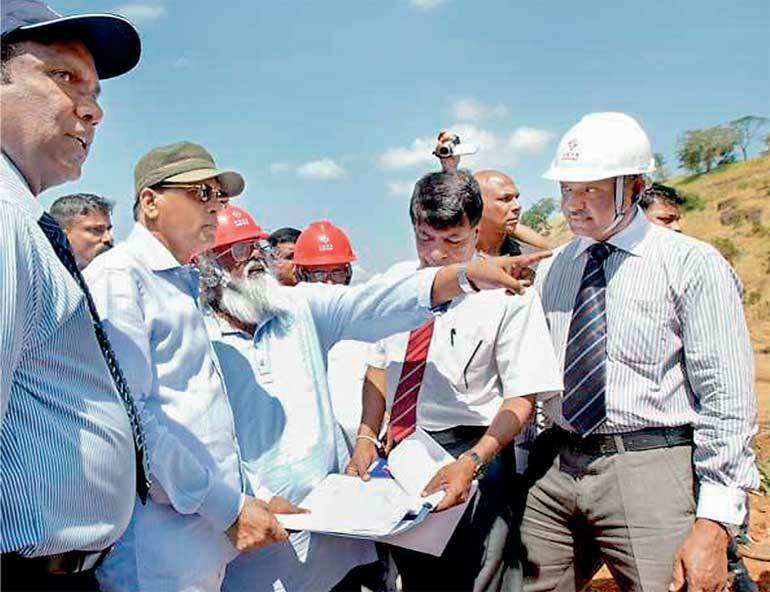 The long-delayed Moragahakanda and associated works have commenced, and though they are as complex, costly and important as the completed works of Accelerated Mahaweli diversion, are hardly being given publicity, information or public discussion. This article intends to enlighten the public on the different aspects and modifications made to the original project. The Amban Ganga is a major tributary of Mahaweli, which originates in the northern slopes of Hunnasgiriya Mountains, flows in a north-easterly course and joins Mahaweli near Manampitiya in the Polonnaruwa district. Kalu Ganga, which collects rains from the Knuckles range, is a major source of water and joins Amban Ganga 14km downstream of Elahera. Soon after being elected President in January 2015, Maithripala Sirisena took over the Mahaweli Ministry and visited Moragahakanda. Addressing the public he stated that when President Rajapaksa inaugurated the Moragahakanda Project in 2007, he was the Minister for Mahaweli Development. Soon afterwards, the President wished to transfer the Ministry to his brother Basil; the transfer was dropped due to protest by MS, but funds were denied and work stalled. In 2010, after the presidential elections MS was allocated the Health Ministry and the project recommenced with the Mahaweli Ministry under Basil Rajapaksa. In addition ‘Terms of Reference, meme Management, Design and Supervision Consultant,’ a 450-page report, gives more information. "During the recent UN and Geneva conferences, Sri Lanka promised impartial treatment to all sectors of the country. The revision of the program and redirecting Moragahakanda water to highly stressed lands in the Northern Province, would be honouring the promise and other countries would agree to fund development projects in the north. The transfer of Moragahakanda water to north would assist development of the war-torn region and people of the north would be eternally grateful to the south for the gesture"
The project involves two phases and the current agreement would fund Phase 1 (2014 to 2024); in addition funds would be used for: (i) confirming the feasibility of Phase 2; (ii) surveys and designs; (iii) conducting environmental and social feasibility studies; and (iv) prepare funding documents to ADB requirements. 1. Kaluganga-Moragahakanda tunnel and transfer canal. 2. Upper Elahera Canal (UEC) to transfer water from Moragahakanda up to Huruluwewa and Manankattiya Reservoirs; and feeder canal to Mahakanadarawa. 3. North Western Province Canal; a combination of 95km of canals and 2 reservoirs to supply existing and new cultivations under in the NWP. 4. Increase height of Minipe anicut and improve Minipe Left Bank Canal. (i) The 8km long tunnel and 9km canal will join Kaluganga with Moragahakanda and convey up to 771MCM (million cubic meters) of water annually from Kaluganga to Moragahakanda reservoir. (ii) The Upper Elahera Canal (UEC), a 65.5km canal (20km of tunnels and 16km of cut-cover conduits) will convey 974MCM annually northwards from Moragahakanda reservoir and terminate at Yakalla; and trifurcate delivering water to NCP canal (640 MCM), Huruluwewa on Yan Oya (128 MCM) and Manankattiya/Mahakanadarawa reservoirs (159 MCM). (iii) The North Western Province Canal will divert water from Dambulu Oya and existing Nalanda Reservoir. The NWPC proposes construction of 96km of canals, including a 940m tunnel and two 25m high earth dams to supply existing and new irrigation systems in the NWP. (iv) Raising existing weir of Minipe anicut by 4m to improve diversion of Mahaweli water and rehabilitate the 76km long ancient canal system to irrigate 10,000Ha in System B. Construction of Phase 2 is not financed under the current ADB program. 1. First 30km of NCPC Project, supplying water northwards to Kahatagasdigiliya. 2. Randenigala - Kalu Ganga canal to transfer water to latter. 3. Lower Uma Oya dam, tunnel and powerhouse to increase water supply to Randenigala. 4. Pumping of Mahaweli water at Kalinga Nuwara to Minneriya via Angamedilla. (i) NCPC commencing from Yakalla with 640 MCM/annum water from Upper Elahara Canal, will be extended 30km northwards to Kahatagasdigiliya, to irrigate 47,500Ha. (ii) The R-K canal running parallel and above Minipe canal will deliver 555 MCM/annum to Kaluganga reservoir. The canal includes 14.6km long tunnel and 2 dams at Hasalaka Oya and Heen Ganga, which will generate 28MW and 5.5MW of hydropower. The Phase 2 proposes to construct the Hasalaka and Heen Ganga stretch. (iii) The Lower Uma Oya dam, a 75m high concrete dam to supply water to Randenigala Reservoir via a 6km tunnel to while producing 10MW of power. (iv) Pumping of 240MCM of Mahaweli river flow at Kalinga Nuwara to Angamedilla. The water will supplement the irrigation needs of Minneriya, Giritale, Kaudulla terminating at Kantalai tank, and will fulfil the water requirements of sugarcane cultivation. 1. Balance works on the 40km long Randenigala-Kaluganga canal transferring water to Kaluganga reservoir. 2. The final stretch of 60km long NCP canal, through Kahatagasdigiliya terminating at Chemadukulam reservoir, providing water to 8,000Ha under minor tanks system in NCP. The water will follow natural drainage channels and deliver 100 MCM/annum into Iranamadu Reservoir and irrigate 10,000Ha under Iranamadu Tank. The ancient Elahera diversion, located 2km downstream of Moragahakanda dam was constructed by King Washaba, conveying water to Minneriya, Giritale and Kantale reservoirs. The Angamedilla anicut also on Amban Ganga midway between Elahera and Manampitiya feeds Parakrama Samudraya with a 24 mile long canal. In addition, a 50 mile long trans-basin canal, Minipe Yoda Ela, built during the King Dasankeliya (459AD), carries Mahaweli waters for irrigation and finally merges with Amban Ganga downstream of Angamedilla anicut. Having diverted Mahaweli waters at Polgolla, the country encountered an unexpected problem. The diverted waters at Polgolla can generate 78MW of power and non-diverted waters 381MW. Thus for power generation, the least diversion would be best. Having generated power, some water is diverted along Minipe canal and to System C; but a large volume ends up in the sea. This argument was used to divert excessive quantities of water at Polgolla, depriving power generation at Victoria, Randenigala and Rantembe; this has resulted in expensive power purchases from private power generators. The raising of Minipe Anicut with Left Bank Canal project along with Randenigala-Kalu Ganga transfer canal will utilise additional Mahaweli water for irrigation after power generation at Victoria and should discourage water diversion at Polgolla. According to the report, Sri Lanka is fortunate to have abundant rainfall averaging 2,500 cubic meters (m3) per person and about 50,000MCM of water discharged to sea. Northern Province receives the lowest rainfall, mainly during the December to February period. The 1500mm rainfall boundary is the dividing line between dry and wet zone. While the center of the country gets abundant rain, the north and extreme south get insufficient rains. 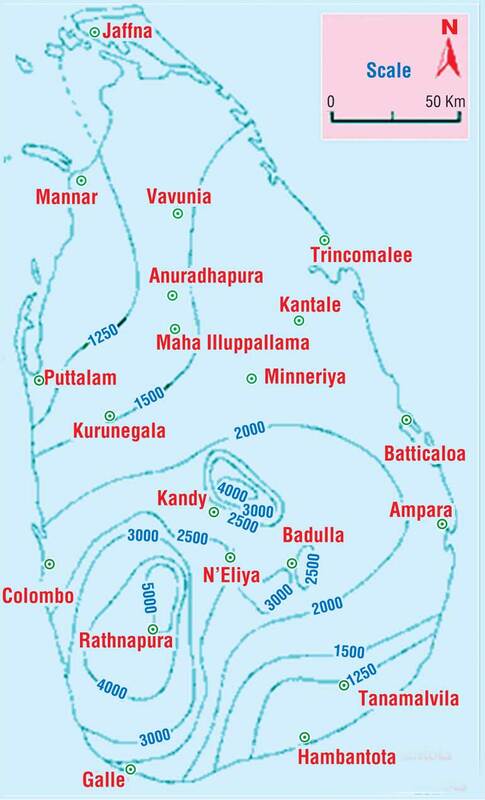 The 1,500mm rainfall line falls just below Anuradhapura (see sketch) and leads towards Mullativu and Jaffna peninsula, which gets only 1,250mm. While ancient kings transferred water from Amban Ganga to irrigate the present Polonnaruwa district, Kantalai was the northern limit. The region receives 1,500 to 2,000mm of rain, and is also blessed with past irrigations systems supplementing moderate rainfall. Mannar district is the lowest rainfall region, but for over thousand years Yodawewa near Mannar received water from Malwathu Oya, passing through Anuradhapura town. After Polgolla diversion, Malwathu Oya is supplemented with runoff discharged from System H and Anuradhapura tanks. Moragahakanda project was expected to satisfy requirements of water-stressed regions beyond Anuradhapura, which receive less than 1,500mm of rain. As shown above the North Western Province Canal entered the picture with instructions from the Secretary in 2010, resulting in NWPC being included as a sub-project under Phase 1, phrased as “NWPC will divert water from Dambulu Oya and the existing Nalanda Reservoir”. But water from Dambulu Oya actually is Mahaweli waters diverted through Bowatenna tunnel to Kalawewa. The proposed NWPC is expected to withdraw 67MCM of Mahaweli water. The NWPC has no relevance to the main project, but was included among projects in Phase 1 and would be the first project completed under ADB funding. The instructions of the Secretary for such a major modification would only be accommodating wishes of the Minister and the President. Technical Assistance Consultant’s Report, Page 9, Figure 1: ‘Layout Map of the Water Resources Development Investment Program,’ reproduced here, shows the main canals, project boundaries and regions covered under the project. The northern boundary generally runs across Padaviya and Omanthai; and the Northern Province beyond Omanthai has been excluded from the project area. The UEC from Moragahakanda terminates at Yakalla and trifurcate delivering water to existing Huruluwewa on Yan Oya (128 MCM), Manankattiya/Mahakanadarawa Reservoirs (159 MCM) and NCP canal (414 MCM). The water issue to Mahakanadarawa in a 30km feeder canal from Manankattiya is referred as NCP1 (Minor), and will supply water to Nachchaduwa, Nuwarawewa, Mahakanadarawa and other tanks around Anuradhapura under Phase 1 (2018-2024). Water supply to the north is referred as NCP2(Major) and the canal runs northwards to Kahatagasdigiliya under Phase 2 (2024-2027) and be extended to Kabitigollawa and Chemmadukulum in Phase 3 (2028-2032); the 92km long canal would flow along Kanakrayan Aru to Iranamadu tank. The NCP canal will issue irrigation water, including Pavatkulam 30MCM located south of Vauniya, Parangi Aru passing through Omanthi and to Pali Aru both commence in Vauniya district and flow westward into Kilinochchi district. Table 1 shows that water issue to Anuradhapura tanks is over twice the amount issued to water-stressed north. Today, Anuradhapura tanks receive water from Kalawewa through Yodaela. Is the requirement for additional water to Anuradhapura tanks to compensate for water diversion from Bowatenna to NWPC, resulting in reduced water to Anuradhapura tanks? According to the report NCP canal issued with 414MCM of water, would feed Pavattakulam with 30MCM and only 100MCM would reach Iranamadu. What happens to the balance water? The so called NCP (Minor) receives a major part of the water supposed to be sent to the north. 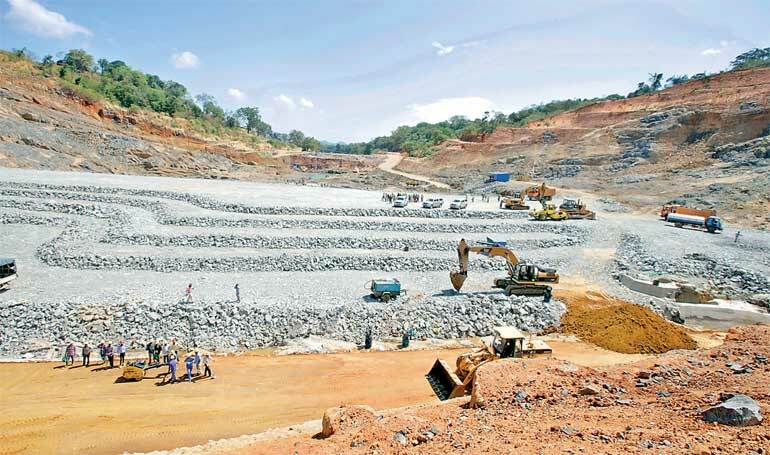 The Moragahakanda dam expects completion by July 2016 and Kaluganga dam a year later. The tunnel and canal connecting both would be constructed under ADB funding during 2015-2019 period. But Upper Elahera Canal transferring water from Moragahakanda would be completed only by 2024. The first stage of NWPC canal supplying water to Mahakitula and Mahakirula (2015-2019) will be the first project to be completed, but will not utilise Moragahakanda water. Thus from July 2016 until 2024 the Moragahakanda water would be wasted. Much talked about issue of 100MCM of water to Iranamadu tank would only materialise by 2032, if all goes well. Meanwhile Iranamadu water will be pumped to provide drinking water to Jaffna Peninsula. President Rajapaksa inaugurated the Yan Oya Reservoir Project in 2012, estimated to cost $210 million, funded by China. Under the project a 2.5km dam is being constructed at Angurugasweva across Yan Oya building a reservoir with a capacity of 254MCM. Water from the reservoir will be diverted to Padaviya tank located within the NCP. The project was criticised by environmentalists as having cost a staggering Rs 41.5million to develop one hectare of paddy. But the government justified the project that “According to the Central Bank Report in 2005, Padaviya was the most poverty stricken Divisional Secretariat in the North Central Province.” Padaviya is within the moderate rainy region, supported with ancient irrigation. Now Yan Oya is fed with additional 128MCM of UEC water. If Padaviya is “poverty stricken” how about the rest of the north, with lower rainfall and without ancient irrigation? The scheduled NWPC and NCP Minor would remove water constraints in regions receiving 1500 to 2,000mm of rain and encourage farmers to cultivate paddy during both Maha and Yala seasons. Farmers prefer paddy cultivation over subsidiary crops, as cultivation is mechanised requiring minimum effort, receives subsidised fertiliser and a high selling price. Sri Lanka has reached self-sufficiency in rice, and surplus stocks were disposed as international food aid, as produced rice fail to conform export standards. Meanwhile, country requirements for potatoes, big onions, maize, chillies, cowpea, soyabean etc are mostly imported, but self-sufficiency is within reach. Unnecessary additional water would distance the country from subsidiary crops. Hardworking northern farmers cultivate crops as onions, chillies, vegetables, grapes, etc. Rainfall in the north is mostly limited to November/December and their crops reach the market in March/April when potato and onion prices tumble. If water is supplied, with availability of land, large scale cultivations would supply country’s requirement of subsidiary crops at reasonable prices. Jaffna farmers use ground water for cultivations and excessive extraction has already caused entry of seawater making some areas uncultivable. If irrigation water is pumped into Jaffna Peninsula, similar to the proposed pumping of Mahaweli flow at Kalinga Nuwara, this will improve cultivations and the ground water quality in the Peninsula. As Jaffna terrain is generally flat, low pumping height would require less power. Although Moragahakanda would be completed by July 2016, supplemented with Kaluganga water, there are no water users until 2024, as NWPC does not use Moragahakanda water. Thus projects implemented with $370 million foreign and Rs. 12.2 billion local, totalling Rs. 61.2 billion will idle for eight years. Comparing, idling Hambantota harbour cost the country $361 million and the Mattala Airport $210 million and Moragahakanda would outdo both of them. The Mahaweli program of the 1960s envisaged the transfer of water from central highlands to water-deficient northern region under the Moragahakanda project. The program was modified after 2010, by introducing North Western Province Canal diverting water from Bowatenna, but hiding the fact as Dambulu Oya water. To compensate, water is diverted from UEC to Anuradhapura tanks under the aegis of NCP Minor. The entire project had been modified by the Secretary, Mahaweli Ministry, under the instructions of Minister Basil Rajapaksa and the President. The modifications delayed the project by four years and the modified report was presented to ADB in December 2014. The long-awaited project to supply water to the starved north had been hijacked by Rajapaksas during the last government. It is clear that Maithripala Sirisena who was the Mahaweli Minister during 2007-2010 and currently is completely unaware of the modifications made to his pet project. NWCP cheating Bowatenna water should be scrapped, but water from Nalanda reservoir could be diverted to NWP as a separate project. Anuradhapura reservoirs have ample water and NCPMinor becomes redundant. Mahakanadarawa tank is not connected to Kalawewa system and could be issued with water. The project envisages issue of 126MCM water to Huruluwewa on Yanoya. But Yanoya is already under development and the region receives over 1500mm of rain. Thus the quantum of water issue needs to be reassessed. Above modifications would improve water availability beyond Anuradhapura. The report does not include the north’s water requirement, but would have been prepared prior to 2010 and therefore would need revision. Most lands in the Northern Province are sandy and are unsuitable for paddy cultivation. Conveyance of water would be in concrete canals or through PVC pipes. Israel leads the world on low water agriculture, also dairying and helps developing countries with transfer of technology. We should request help from Israel to develop the north with efficient use of diverted waters. The revised NCP canal and the distribution system needs to reach completion by 2024, when Upper Elahera Canal water reaches Yakalla. This could only be possible with an ‘Accelerated Water Distributed Project’ similar to Accelerated Mahaweli Project and would be achievable with the President heading the Ministry. The project needs urgent funding and JICA who carried out ‘Trans-basin Study (1989)’ and conversant with the project could be requested to fund the extended NCP Canal. During the recent UN and Geneva conferences, Sri Lanka promised impartial treatment to all sectors of the country. The revision of the program and redirecting Moragahakanda water to highly stressed lands in the Northern Province, would be honouring the promise and other countries would agree to fund development projects in the north. The transfer of Moragahakanda water to north would assist development of the war-torn region and people of the north would be eternally grateful to the south for the gesture.